Let me start by saying that I love the SR07 from Surefire. It’s an incredible, well designed tape switch that gives you both momentary and constant on activation and if mounted at 12 o’clock, it gives you access to your light no matter which side you’re shooting from. The main upgrade with this SR series of switches over the ST series was the fact that you could easily mount this to a picatinny rail without needing a mount or velcro. This mount that’s designed into the switch actually works quite well. Especially if you use a few zip ties in the provided slots. It works. There’s nothing wrong with it. At least not that I’ve personally experienced or heard of. Having said that, the Cloud Defensive LCS is by far the most secure option for securing a tape switch to your rail. 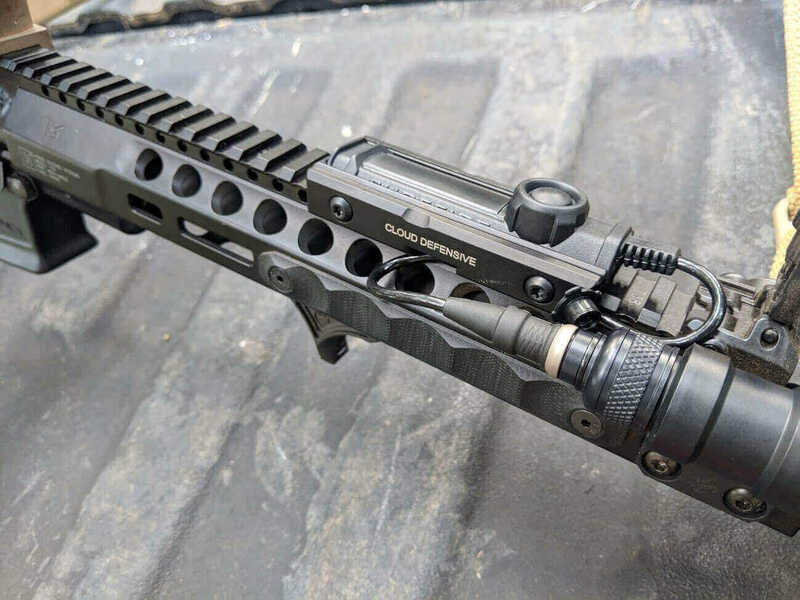 They’re currently available for the ST series from Surefire and the ProTac Railmount/ ProTac Railmount HL-X from Streamlight. They’re definitely the way to go for those two switches. Nothing else even comes close. I’ve never really been scared of modifying my gear a little to make it work. If you’re not a fan of playing doctor with stuff, this probably won’t be for you. Also, I’m pretty sure this will void the warranty from Surefire so proceed at your own risk. Now that that’s out of the way let’s dig into it. I recently found out about this little known surgery that you can perform to make the Cloud Defensive mount for the Streamlight ProTac RailMount & ProTac Rai Mount HL-X work with the SR07. I didn’t discover this and I’m not taking credit for it but it works quite well. Another huge benefit of this mount is that it manages your cable extremely well. On the underside of the mount is a channel that you can run your cable through so you don’t end up with 7” of cable hanging all over the place. The usual fix is to just use a few zip ties but this is a lot more secure and cleaner. Basically all you need is a box cutter (do yourself a favor and make sure it’s a fresh blade). You’ll want to cut off the feet so it can fit inside of the mount. A word of advice is to cut off less than you think you need to. Once it’s off you can’t really put it back and you may have just made a $100 mistake. Below are some pictures to give you an idea of how much you need to cut off. I made the mistake of using a dull blade and it slipped and took off more than I should have. It still works and is REALLY secure but it’s not as straight of a cut as it could be. Cut off a little, try it out and then shave off a little more if need be and you’ll be fine. Just be careful not to cut into the pad itself and damage or compromise the electronic components inside. As you can see the end result is a very securely mounted SR07 to your rail. This thing isn’t going anywhere. If you have any questions or need a little help, shoot me an email at: [email protected] I’ll help any way that I can. Changing the Switching Order on the Surefire Sidekick. For the SR07 to work in the LCS, it needs to be the Protac version. The one made for the ST07 won’t have enough room for the modified SR07 switch. Hopefully that helps!